It was a delightful providence. I was a commissioner at the PCA’s General Assembly in Atlanta this past week, which usually turns out to be a time of significant encounters with people in my denomination. It all started with my wife’s engagement with Melissa Ridgway, who is supposed to be a woman but who is really more like a tornado of relational connecting. Through Melissa I was introduced to, and suddenly in a conversation with, Scott Swain, president of Reformed Theological Seminary in Orlando. But Scott is also a prominent Trinitarian theologian. I love hanging around these exotic beasts, as they have thought long and hard about the meaning of the great Three in One. As such, they stand as caretakers of one of the keys to the universe. The professor seemed to resonate with my view that what is going on in our culture now is really a conversation between Christ and His church, forcing us to go back to the Scriptures and get a deeper anthropology, that is, a better understanding of who we are. 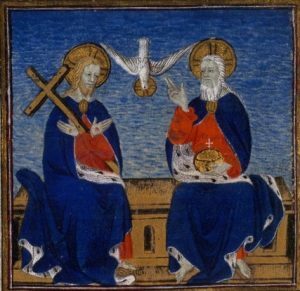 Isn’t it Biblically appropriate, I asked Professor Swain, to understand our relationships through the Trinity and the Trinity through our relationships? He allowed that, with proper caveats and if done carefully, it is. I am all for being careful and orthodox, so I was delighted to continue. The conversation led inevitably to St. Augustine. I offered the thought that the great Augustine, after teaching the church the (direly needed) understanding that the Persons of our God are distinguished from One Another by Their relationship to each Other (their distinguishing properties), Augustine failed to follow through in his insight by identifying the image of God in us in our relationships to one another. 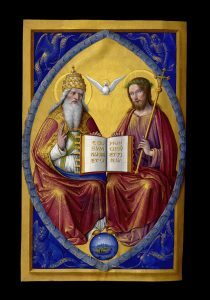 That is, when God said that He was making us in His image, male and female, it was a statement about the Trinity. So when we think about who we are, a big part of it should be how we enter into intergendered relationships as an analogy to what the persons of the Trinity do mysteriously and infinitely in God ThemSelf. Instead, Augustine talked about how we have things like a mind and a will and stopped there. 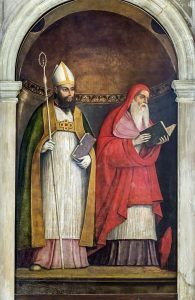 Dr. Swain offered the correction that Augustine did have some “social” elements to his discussion of the Divine image in us, how the theologian emphasized our having a mind and a will in order to love. Point taken. I was glad to be corrected. But then, Augustine demeaned that image in women (Eve is the lower mental function of action, etc.). Many people, by the way, have tried to understand what Augustine thought about women and failed. This is because, with all due respect to his brilliance, I don’t think that even Augustine understood what Augustine thought about women. How about you? What do you think our being made in the image of God means? Thinking through our intergendered relationships in direct comparison to the relationship of the Trinity amongst themselves is fascinating. It brings greater depth to my understanding of what it truly is to be made in His image. I recently engaged in conversation with a non-Trinitarian “Christian”. At first glance, it seemed to me that we could find some common ground to work from. However, very quickly I realized how integral the theology of the personhood of God is to EVERYTHING. It was pretty eye opening, and I look forward to discussing her beliefs with her further in the future, as God allows. Hi Sarah. Some experience. It turns out that Arianism (the position that Jesus wasn’t really God) turns up in more places than just distant church history. I once had a conversation with a high ranking principal of the Jehovah’s Witness denomination. I brought the conversation to John 1:1, you know, where John says, “And the Word WAS God” and my friend translated it instead as “The Word was a god” (feasible, because ‘God’ lacked the definite article, but very weak, because he wouldn’t do that consistently with other places where “God” lacked the definite article, even in the same chapter). But your approach seems much better, talking about how the Trinity relates to everything we believe. Good job! A neat little book about that by Michael Reeves might interest you.